August 25, 2017 – The Space and Missile Systems Center’s Remote Sensing Systems Directorate held a ribbon-cutting ceremony today to unveil the addition of an unclassified development environment to the existing Tools, Applications, and Processing (TAP) Laboratory. This open environment will allow more third-party developers to create capabilities using unclassified remote sensing data without the time and cost of acquiring government security clearances. These new capabilities will have the potential to transition from development to operations rapidly in support of both military and civil applications. 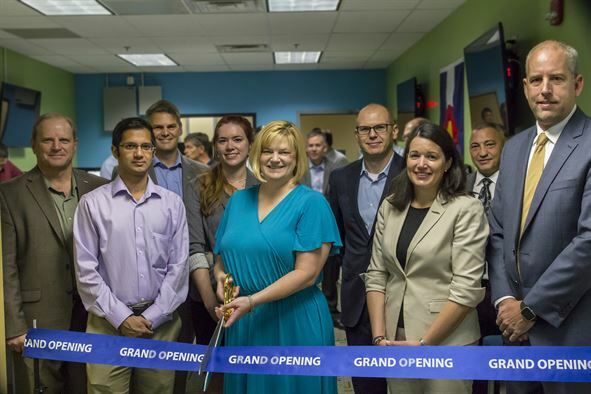 The TAP Lab opened in April 2016 and offers academia, industry and other government agencies access to remote sensing infrared and weather data in a research and development environment. It promotes applied research and agile development of algorithm improvements, data storage and dissemination, user experience, and data fusion. However, the lab was only available to users with a Secret-level security clearance until now. Prototype applications have the potential for test and evaluation by end users. Capabilities receiving positive assessment will be considered for transition, via appropriate acquisition programs, into operational applications in the Space Based Infrared Systems Mission Control Station and Overhead Persistent Infrared Battlespace Awareness Center at Buckley Air Force Base, Colorado. To date, 151 white papers have been received resulting in 18 proposal requests. The Lab is managed by the Remote Sensing Systems Directorate at the U.S. Air Force Space and Missile Systems Center, El Segundo, California. The unclassified development space was created in conjunction with the University of Colorado, Boulder, Colorado; Lockheed Martin Space Systems Company, Sunnyvale, California, and Colorado-based small businesses Net-Centric Design Professionals (NDP) and Cosmic AES. Register at boulderlab.org for all events, solicitation notification, or to sign up for a tour.